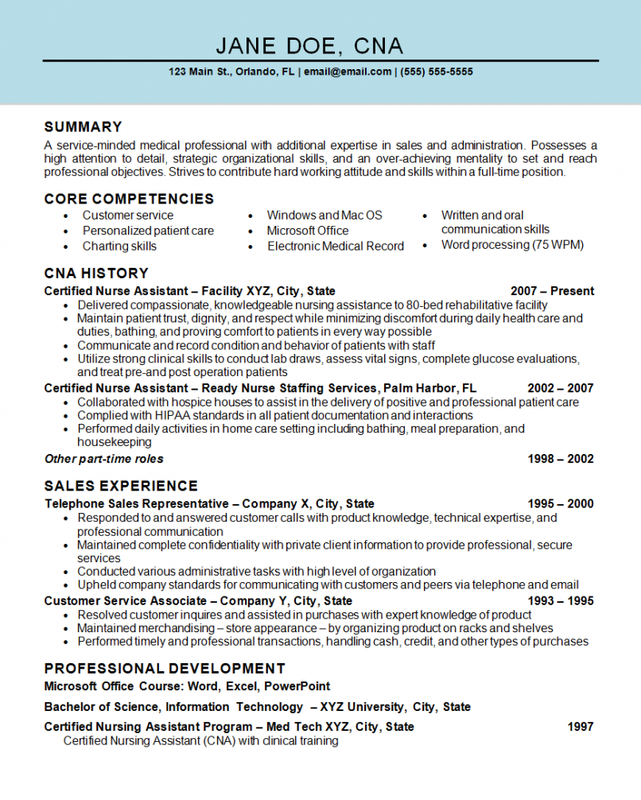 The resume below as written for a Certified Nurse Assistant with previous experience in Sales. The CNA Resume Example can also be useful for anyone seeking positions in healthcare or customer service. The Candidate did not have a specific job in mind to apply for, so the resume needed to show multiple skill sets which could be applied to any available job. In order to do this, neutral language was utilized to show strengths for various job types. The writer touched upon both areas of expertise the candidate had in order to show flexibility and a variety of skills. Delivered compassionate, knowledgeable nursing assistance to 80-bed rehabilitation facility. Maintain patient trust, dignity, and respect while minimizing discomfort during daily health care and duties, bathing, and providing comfort to patients in every way possible. Communicate and record condition and behavior of patients with staff. Utilize strong clinical skills to conduct lab draws, assess vital signs, complete glucose evaluations and treat pre-and post- operative patients. Collaborated with hospice houses to assist in the delivery of positive and professional patient care. Performed daily activities in home care setting including bathing, meal preparation, and housekeeping. Responded to and answered customer calls with product knowledge, technical expertise and professional communication. Maintained complete confidentiality with private client information to provide professional, secure services. Conducted various administrative tasks with high level of organization. Upheld company standards for communicating with customers and peers via telephone and email. Resolved customer inquiries and assisted in purchases with expert knowledge of product. Maintained merchandising – store appearance – by organizing product on racks and shelves. Performed timely and professional transactions, handling cash, credit and other types of purchases.